Before you proceed: Are you in a hurry, or just lazy, or do not like to fiddle around with creating customized ESXi ISOs? Then skip to step 7 at the bottom right now and forget the rest! Alternatively you can keep the English layout and enter all special characters using Alt+NumPad ASCII codes: - is code 45, | is code 124 and " is code 34. Here you are: (In this example) you have a Realtek 8168 Gigabit NIC with the PCI ID id 10ec:8168. 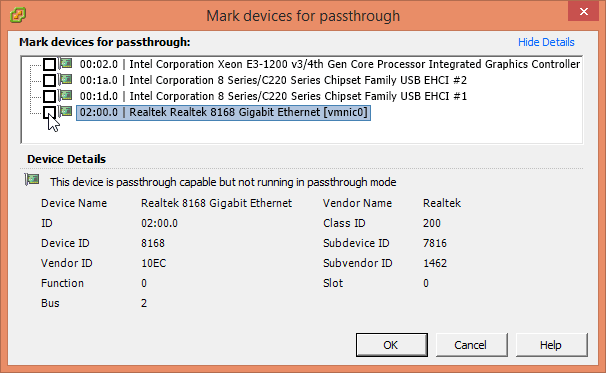 A while back I posted about the Realtek 8168/9 and Marvell NIC drivers being removed in ESXi 5.5. They are still available in ESXi 5.0/5.1 and thus in the VMware Online depot. So it is quite easy to create a customized ESXi 5.5 installation ISO that includes these ESXi 5.1 drivers (they still work with ESXi 5.5). This example will find a version of the net-e1000e driver that is newer than the one that ships with ESXi and thus supports some more Intel NICs (like the I217-LM and -V). If you cannot find your NIC's exact PCI ID in the V-Front Online Depot then you are almost out of luck. Proceed to step 5 then. This will build an ESXi installation ISO with the latest 5.5 patch level and (in this example) the community supported net-e1000e driver included. This will build an ESXi 6.0 installation ISO with the latest patch level and (in this example) the community supported up-to-date Realtek 8168 driver net55-r8168. If you haven't found anything in the V-Front Online Depot then there is still a small chance that someone has already created an ESXi driver for your device that I have not (yet) added to the V-Front Online Depot ... The only way to find out is using your favorite Internet search engine! 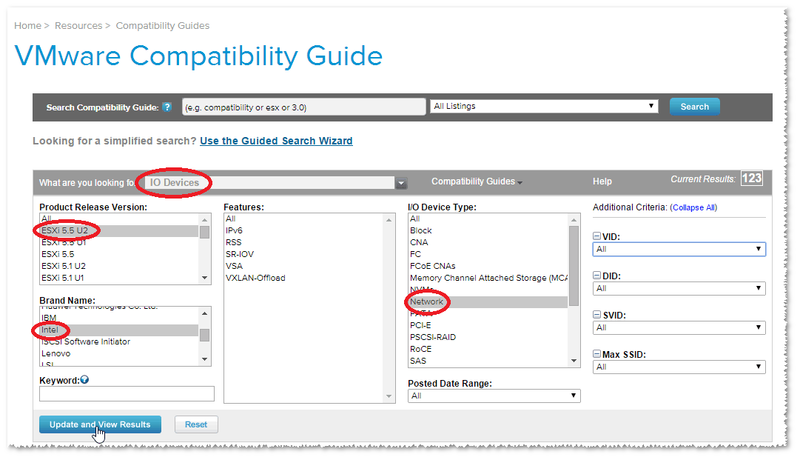 But please search specifically for a VMware ESXi driver for your NIC! Some people just search for a Linux driver in the false belief that you can use Linux drivers with ESXi. You can not! ESXi drivers can be derived from Linux drivers, but this involves modifying and re-compiling the source code, and packaging it into the appropriate format (VIB file or Offline Bundle)! 6. Be bold: Create your own driver! Still failing? Your second last chance to get ESXi up and running with your whitebox is to create an ESXi driver for your unsupported NIC on your own! Are you bold? Then go and read my quick start guide How to build device drivers for ESXi 5.x! But please do not come back to me with questions on how to set up the build environment and overcome compilation errors - I do not have any skills in this. 7. Always easy: Go and get a compatible controller! The one thing that will always help you to overcome the "No Network Adapters" error is simply getting another NIC that is supported by ESXi out-of-the-box. A lot of Intel Gigabit NICs will work, and there are affordable models available, even dual or quad port devices. But before you purchase a new one be sure to check the VMware HCL if it is supported by the current ESXi release. You can also use the new Guided Search Wizard of the HCL to check if your NIC of interest is included here. If you were forced to get a new officially supported NIC to get ESXi up and running then you may wonder if you can still make good use of the other unsupported NIC that sits there in your box without a proper ESXi driver. The host PCI device must then be added to the hardware configuration of a VM which will see the NIC as-is (instead of the standard emulated or paravirtualized vNIC types) so you will need a suitable NIC driver for your guest OS, but it shouldn't be too hard to find that. If your unsupported NIC is attached via USB then you need to use USB passthrough to make it available to a VM. This setup is described in KB1022290. With the most recent ESXi 5.5 patch (of Oct 2014) this also works with host connected USB 3.0 devices, but this requires some tweaking: In another recent blog post I already described how to permanently enable the required xHCI driver in ESXi. I hope that you find this guide helpful - if you think that some important information is missing then please comment! What happens with the customized drivers when updating ESXi? if you do it right then they are preserved. Use "esxcli software profile update ..." like described e.g. in this post. I have a driver for new rtl8168 cards built from 8.039.00 sources. Is it possible to publish it on your site? that sounds great! Can you please send me the package and any information that you want to publish along with it via e-mail to vibsdepot@v-front.de ? Please, can you share the SOURCE CODE of the 8.039.00 driver for ESXi? Version 8.039 lacks support for rtl8168 revision "G" and up! I don't think that Nadin will read this comment, but you can send an e-mail to the address that is listed on the Wiki page of the net55-r8168 package. I already done this two weeks ago! But, no response. So, at time, I'm doing an effort for find the source code of this driver, or suggest to someone to recompile the driver using the last version of the Realtek source driver. The reason because the driver don't work with new chip revisions is the "microcode" included in the driver. It is updated in each driver version, and not compatible with newer chips. Or including the source in the VIB file. If i cant find the availabe nic driver for pic id: 8086:100e, can i use other nic driver? this device is supported by the builtin e1000 driver - should work out-of-the-box. No more, :( it is on the list of deprecated device for esxi6. Can I use e1000 driver to slipstream? Thanks for this post. The most useful part for me was to search by the PCI ID instead of the vendor name. I have a SysKonnect card, but the syskonnect driver didn't work on my ESXi6 for this card. I then noticed the PCI ID was in the net51-sky2 VIB ! Thanks for the detailed steps. By following them, I figured I have an Intel 82545EM Giga Eth controller (Copper) card (btw, my laptop is Lenovo T520) which is supported by ESXi 6 or 6U according to VMware Compatibility Guide. However, it is not recognized by the system as I still got the same error message "No Network Adapters" during installation. Do you have any idea on this? Thanks again. We will continue troubleshooting from there! Thanks very much Andreas. For the results, please see the screenshot picture attached in the email I sent to you. Appreciate you help. It turned out that Gary had installed ESXi inside a VM, and that VM was configured with only 2 GB RAM. ESXi 6.0 requires at least 4 GB RAM, and booting it with 2 GB RAM will result in the false error message that no network adapter can be detected. He could resolve the issue by configuring the VM with 4 GB RAM. "booting it with 2 GB RAM will result in the false error message that no network adapter can be detected." I wish I'd read the comments on this page earlier! I was used to editing upgrade_precheck.py to get ESXi to install with <4GB RAM, but 6.0 seemed not to mind it. So when it said there was no network card, I took that at face value and spent ages with the customizer trying different driver packages, and scouring the web. Thank goodness a search for the NIC's device ID led back to this site and I found the answer here in the comments. Just wanted to say how much I appreciate this site and the tools. I've made a small donation to show my thanks. thank you for your feedback and your donation, much appreciated! thanks for a great website. I'm trying ESXi 6 on mini-itx motherboard Gigabyte GA-1037UN-EU and I have problem with built-in NICs. There are two Realtek NICs 8168 (id 10ec:8168). I got them working using the net55-r8168 package. BUT - both NICs works on 100 Mbps/FD only. I change the settings in vCenter to 1000Mbps/FD but it still runs 100 Mbps (reboot didn't help). This problem is not related to switch port settings/cable - for example previous Xpenology installation or Xenserver installation work on 1 Gbps without any problem. Any idea what can cause this and how to solve this? Thanks alot, the Intel I217 was missing from my ESX 5.5 iso, went to VFront and got the VIB file, used your script to customize the iso, WORKED LIKE A CHARM. I know that this post have some time but, im trying to install ESXi 6.0 because i want to learn about this before i enter to the university and i have an idea but well, im trying to install it on a laptop(HP Pavilion g7 1117cl) that can be a reason to this error of network interface not detected? I have 4gb of ram (3.45 Usable)and the wifi card its installed...Thanks. please see my later post here: http://www.v-front.de/2014/12/how-to-make-your-unsupported-nic-work.html. You won't be able to use the WiFI card, but the onboard LAN adapter might work with a custom driver. However, having less than 4 GB RAM available might be a problem, because ESXi 6.0 requires at least 4 GB RAM. Can you upgrade RAM, use another machine or try ESXi 5.5? I am not able to install esxi 6 due the error. Intel Corporation Ethernet Connection (2) I219-V [8086:15b8]. Do You have any suggestion? I have wireless tp-link usb adapter as well. Can I use it? be sure to install the latest version (Update 1b) of ESXi 6.0. Only that supports the I219 NICs. You can create the ESXi 6.0 U1b installation ISO using my ESXi-Customizer-PS script. You won't be able to use the WiFi adapter, sorry. I had had last version (that I can see) VMware vSphere Hypervisor 6.0 Update 1 - Binaries before I asked. Its form VMware Download Center. I am not sure that from September is the last. no, this is NOT the latest version. You need Update 1b published on Jan 7th 2016 with the net-e1000e driver version 3.2.2.1. See https://esxi-patches.v-front.de/ESXi-6.0.0.html#2016-01-07. I just wanted to say that I successfully used this to roll a custom ISO for ESXi 6.0 Update 1b with the latest Emulex driver, v10.7.179.0-10OEM.600.0.0.2768847,for HP BL460c G7 blades with the NC551i CNA. I've been struggling for many hours trying to find the right combination. Your tool just saved a c7000 chassis full of G7s from the auction block. ... for HP hardware you should really use the HP Customized Installation ISO. That should include all necessary drivers plus CIM providers for hardware monitroing and more. See my HP & VMware Links page! I've got a dual port intel 82546EB (8086:1010) which apparently USED to be supported, but isn't anymore, but I can't find a driver for it.. Is there any way to use an old 4.x driver on an already installed 6.0 ESXi or am I going to be stuck installing 4.x from scratch and upgrading through to 6.0? Thanks for your help! sorry, ESXi 6.0 is not compatible with ESXi 4.x drivers. Even installing 4.1 and upgrading to 6.0 won't help you. Hi Andreas, I seem to be hitting a PS error when running the script you have provided. The term 'Get-PowerCLIVersion' is not recognized as the name of a cmdlet, function, script file, or operable program. Check the spelling of the name, or if a path was included, verify that the path is correct and try again. Any suggestions? I can't find a way around this currently, running a Get-VICommand doesn't show this or any equivalent command available to me. Thanks that's given me a solution! Hi andreas I would like to thank for your work as it really helps people that want to try out esxi on home and consumer equipment, I've read and understand the steps but on the display "no network adapter" i cant press [alt and F1] my PC always freeze on the screen and i need to reboot my pc. Just wanted to ask im using asrock z97m anniversary mobo and it uses Realtek RTL8111GR. Is this under the Net55-r8168 package? Thanks in advance! yes, the net55-r8168 package will probably work for the NIC. The PC freeze might not really be the PC freezing, but the keyboard just not working!? There have been reports that on some systems USB keyboards are not working with ESXi until you connect them to an *internal* USB port. Wrong! The package Net55-r8168 doesn't work with *GR* or other chip revisions later than 8111E. The source code of the Net55-r8168 is at time missing. Only until it is available is possible to compile a new upgraded version of the driver. Thanks for your help Andreas..!! Good work..!! I've been using your net55-r8168 package w/ ESXi 6.0 to get my Realtek 8168 network adapter working. I see that there's a ESXi 6.0 Update 2 release, which includes several network driver packages. Will any of them interfere with your net55-r8168 package? I don't have physical or KVM access to the box, so need to ensure that I still have network connectivity when it comes back from a reboot. I just upgraded a white box server using the net55-r8168 package to ESXi 6.0 U2. No issues here, the Realtek NIC and driver is still working. I am trying to find out if ESXI v5.5 can recognize A USB to Gigabit adapter. I currently am running the ESXI on a Intel NUC(NUC5i5RYH) i had to customize the installation ISO to get the network adapter to work, and it works fine. I am just curious if you have been able to get a USB to Ethernet adapter to work or not. For one specific model of an USB 3.0 Ethernet Adapter there is now a driver available. See here. The Vib it misses is vghetto-ax88179-esxi55u3.vib, which is the VIB for the adapters drivers. please see the ESXi-Customizer-PS project page for how to get support with the script. Thanks! This might be a dumb question, but will net55-r8168 and net51-r8169 work on the latest 5.5? They do work on the latest ESXi 5.5 (and the latest 6.0)! Great, thank you. Would you recommend using them over the older net-r8168/etc for 5.5? net51-r8168 is the same driver as the VMware supplied net-r8168, just renamed to work around the ESXi 6.0 black list. net55-r8168 is a newer version of the Realtek driver that supports more adapters and works fine since years (at least for me). I'd recommend net55-r8168. Excellent article and tools. Your instructions have got ESXi 6.0 working on my MSI Z87-G43 using the on-board Realtek card. I'm trying to create custom ISO with ESXI 6.0u2 with r8168 integrated, according your manual and tools you've provided. "FATAL ERROR: VMware.VimAutomation.Core is not available as a module or snapin! It looks like there is no compatible version of PowerCLI installed!" Powercli VMware-vSphere-CLI-6.0.0-2503617 installed. OS - Windows 8.1 Ent. PATH variables to Powercli - exists. try to launch a PowerCLI session window first (using the PowerCLI shortcut on your desktop) and launch the script from within there. Does this work? If I use the 6.5 ISO and do an upgrade to a 6.0 system that has the RealTek custom update noted above, will the settings and VIB be preserved after the update, or do I need to run it again? Dude, thank you this blog is gold! you've got an awesome blog going here - i've learned a lot! has anyone succeeded in getting esxi 5.5 or 6.x installing over ethernet (USB or thunderbolt) -- or even getting the installer to recognize thunderbolt ethernet adapters? in my case (macbook air and macbook pro) the installer runs successfully, but as soon as the esxi kernel boots, it says that no supported network adapters were found. lspci -v shows only wireless, and thunderbolt ports, but no ethernet-adapter-on-thunderbolt. the latter *does* show up on the same laptops under OSX (with a PCI ID listed in the ESXi driver maps, even), but if the ESXi kernel can't see it on the PCI bus, it can't drive it. any insights/pointers/experiences? William Lam has done quite a bit of work in this area. I suggest that you search on his blog: http://www.virtuallyghetto.com/?s=thunderbolt. This was a life saver, thanks! No issues creating a custom image using the PS script, my Realtek NIC is working as expected. Magic. Fantastic how-it, and resource. Worked great. I have a NUC with an 8086:15d8 driver, is there any way to fix this please. I cannot seem to find the correct driver. I am using ESXI 6.5.
this device is supported by the VMware inbox driver ne1000 with ESXi 6.5 U1. For more info see the HCL here: https://www.vmware.com/resources/compatibility/detail.php?deviceCategory=io&productid=42028&details=1. Hi, I got the error: PS>TerminatingError(Export-EsxImageProfile): "[WinError 10054] An existing connection was forcibly closed by the remote host"
Please see this tweet for a possible resolution! 2. In your %TEMP% directory you will find some files named if-server.log. * Have a look at the one with the latest time stamp. Here are possible causes/solutions: https://www.codeproject.com/Questions/1060070/ConnectionResetError-WinError-An-existing-connecti. I guess "Solution 3" applies to you. Are you on a regulated corporate network? Can you try this from home or another unrestricted network? If you have any Firewall (e.g. Kaspersky) disable it and try again! I had the same issue ... when I temporary disabled the firewall, the communication will be stable with the vmware. PS>TerminatingError(Export-EsxImageProfile): "[WinError 10054] Eine vorhandene Verbindung wurde vom Remotehost geschlossen"
>> TerminatingError(Export-EsxImageProfile): "[WinError 10054] Eine vorhandene Verbindung wurde vom Remotehost geschlossen"
Thanks for the answer. I will test it within the next days and let you know. If somebody wants to try this please note that you will also get the WinError 10054 when using the VMWare online depot. So you need to download the ESXi offline bundle manually from the VMWare Website. For me it also worked to download the offline bundle with PowerCLI but only NOT customized. So I exported one of the standard profiles from VMWare with the Export-EsxImageProfile command to a zip file and then imported this one to the software depot to customize it. Explanation was very clear. The script works fine.